Harry Potter fans who have found years of happiness, excitement, and comfort in J.K. Rowling's successful series are passing those feelings on to new readers by leaving touching notes hidden in the books' pages. As part of a new campaign called #PotterItForward, they call themselves Potterheads and write messages about their own experiences with Harry, Ron, and Hermione. Before they leave their surprise notes behind, they're taking photos and sharing them on Instagram to inspire other readers to do the same. According to Seventeen.com, the movement began from the Harry Potter fan site MuggleNet, which included a yellow Post-It note inside a copy of Harry Potter and the Half-Blood Prince. "The world of Harry Potter saved me during my darkest hours,"the note read. "Use this to escape reality & to let your imagination free. Never forget that you are amazing." Putting explanation to the picture, MuggleNet encouraged other fans to follow suit, adding their own personal messages in the magical series: "Join our global movement and #PotterItForward by leaving a magical note in a bookstore or library's copy of #HarryPotter!" And plenty of fans have. "Welcome to Hogwarts! 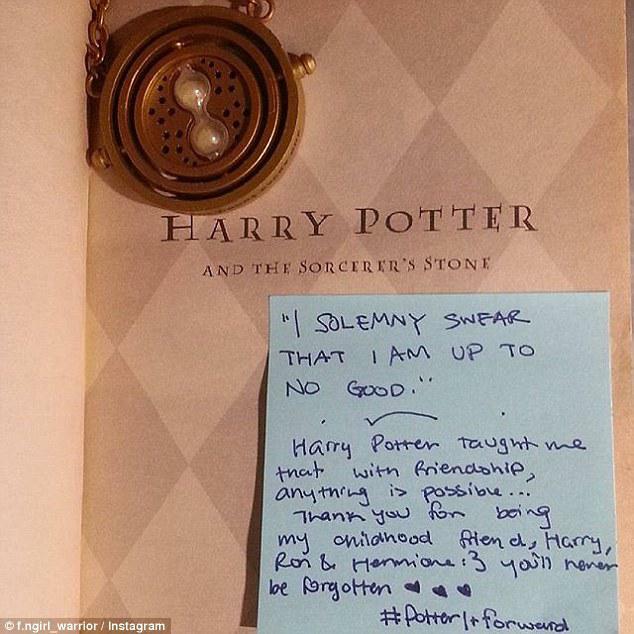 "a fan wrote in a copy of Harry Potter and the Sorcerer's Stone. "From my Potter generation to yours, I hope you find a home away from home in these pages like I did. On a bad day, I know I can still turn to Harry, Ron, and Hermione to make me feel comfortable with myself again. " Another fan, @willowmahogany13, left the message: "Whether you're a seasoned reader or a fresh newcomer, I hope the adventures and messages this series provokes your thoughts in some way— or at the very least, give you a great story to escape to. " Though the movement began in the US, it's now reached countries all over the world—as Harry Potter has been published in at least 70 languages. Fans in Russia, the Czech Republic, and Scotland—where Hogwarts is located—have also shared photos of notes they've left or found in books. 1. What do Harry Potter fans do before they leave a touching note in a book? A They take a photo of the note and share it on Instagram. B They go to a bookstore or library to find a copy of #Harry Potter. C They join the global movement of #PotterItForward. D They write their feelings on a yellow Post-It note. 2. If you want to visit Hogwarts, you will have to go to ______. 3. What lessons can we learn from the Harry Potter series to live a meaningful life? A We should escape the reality. B We should believe in ourselves. C We should feel comfortable with ourselves. D We should use our imagination.